The Ford Edge is a midsize crossover sport utility that offers better fuel economy and road manners than similarly sized truck-based SUVs such as the Ford Explorer. The Edge handles better than traditional SUVs while offering almost as much cargo space. It's about 500 pounds lighter than an Explorer and enjoys an edge of three to four miles per gallon in fuel economy. It offers similar advantages over other traditional SUVs. Benefiting from an available all-wheel drive and a fully independent suspension, the Edge is easier to control than a truck-based SUV in the snow or on wet, slippery roads. Getting in and out of it is easier, too. Yet it gives up nothing in passenger and cargo space. In fact, the back seats in the Edge are roomier than those in the Explorer, a benefit of its design. The Edge is not small. Considered a midsize crossover utility vehicle, the Edge competes with the Nissan Murano and Toyota Highlander. All of these vehicles are larger than they look, a result of their slippery styling. We found the Edge roomy and comfortable with fully foldable seats for carrying larger cargo. It drives well, with good performance from a modern V6 engine mated to a six-speed automatic transmission. Edge was introduced as a 2007 model. Changes for 2010 are relatively minor. Most significant are engine improvements resulting in fuel economy gains of one to two miles per gallon. Edge is EPA-rated at 18/25 mpg City/Highway with front-wheel drive, and 17/23 mpg with all-wheel drive. 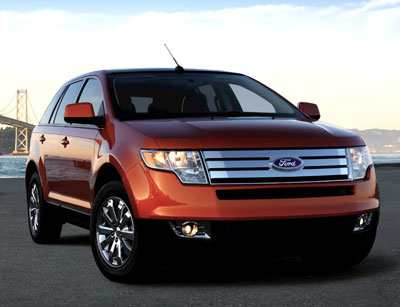 The 2010 Ford Edge comes in four trim levels: SE, SEL, Limited, and Sport. All models are powered by a 3.5-liter V6 engine that produces 265 horsepower and 250 pound-feet of torque, coupled to a six-speed automatic transmission. Front-wheel drive is standard, and all-wheel drive is available. The Edge SE FWD ($26,920) and SE AWD ($28,770) are equipped with cloth upholstery, driver's seat lumbar adjustment, air conditioning, cruise control, tilt/telescoping steering wheel, 60/40 split second-row seat, power windows, power locks, power mirrors, remote keyless entry, four-speaker AM/FM/CD stereo with auxiliary input jack, rear spoiler, and P235/65R17 tires on alloy wheels. Options include a Convenience Package, which includes an auto-dimming mirror, reverse sensing system, automatic headlamps, door-entry keypad, steering-wheel audio controls, and Satellite Radio ($845), and a roof rack ($95). The Edge SEL FWD ($29,920) and SEL AWD ($31,770) add fog lamps, six-way power driver's seat, leather-wrapped steering wheel with audio controls, keyless keypad entry, six-disc CD changer, automatic headlights, auto-dimming rearview mirror, and a vehicle information center. The SEL Rapid Spec Package 202A ($2,555) includes the Leather Comfort Package (which consists of leather upholstery, heated front seats, dual-zone climate control, particulate air filter and six-way power fold-flat front passenger's seat), and adds 18-inch chrome wheels and 245/60R18 tires. Other options include a cargo package ($555), Panoramic Vista roof ($1,595), Ford's Sync entertainment and communications system ($395), navigation ($2,380), and DVD entertainment ($1,995). The Edge Limited FWD ($32,720) and Limited AWD ($34,570) come with leather upholstery, Ford's Audiophile sound system with nine speakers, Ford Sync communications and entertainment system, rear park assist, heated front seats, flat-folding six-way power adjustable front passenger seat, memory for the driver's seat and exterior mirrors, second-row reclining and power-folding split seats, dual-zone automatic climate control, universal garage door opener, interior air filter, heated mirrors, and P245/60R18 tires on chromed alloy wheels. Items not included as standard on the Limited are available as options, for the same prices as on the SEL. The Edge Sport FWD ($33,920) and Sport AWD ($35,770) come with unique features, including leather seating with Alcantara suede inserts; an eight-piece body kit with special front and rear fascias, body-side cladding, and side-skirt rocker moldings; and 22-inch machine-polished wheels. Options available on other trim levels are also available on the Sport. Safety features that come standard on all models include dual front airbags, seat-mounted side-impact airbags for the front seats, side-curtain airbags with rollover protection for both rows of seating, anti-lock brakes, traction control, AdvanceTrac electronic stability control with rollover mitigation, and a tire-pressure monitoring system. Rear park assist is available and can help alert the driver to objects or people behind the vehicle when backing up. The Ford Edge is bigger than it looks in photos. The reason is that it has a wide track and a long wheelbase with short overhangs. The Edge is almost eight inches shorter in overall length than the Ford Explorer yet its wheelbase is just over two inches shorter. Also, the track on the Edge is over three inches wider while the overall width is about two inches wider. This means that, in relation to the Explorer and speaking proportionately, the Edge has it tires pushed farther outward, closer to the corners, both in length and width, which gives it a wider and longer stance on the road. The wide track and long wheelbase relative to the body make the Edge look solid: The four wheels are near each corner, making it appear firmly planted on the road. The long wheelbase and wide track are not just about looks; they make for a more stable vehicle because the majority of the mass is inside the wheels. Visually, this aggressive stance makes the Edge stand apart from the relatively tippy look of traditional SUVs. The Edge features Ford's bold, American design. The big chrome grille is placed well forward and has wide chrome slats that merge into the relatively small headlights at each side. The high hood is short as the windshield rakes forward more like a sports car or modern minivan. Despite having a relatively high waist line with shallow side windows, the Edge does not appear as stubby as photographs sometimes suggest. The sporty look is helped by pronounced fender flares and large wheels. The tailgate slopes quite significantly and is nicely rounded, avoiding the truck-like tailgates found on many SUVs. The Vista Roof adds expansive twin glass moonroofs that cover the whole roof, providing all passengers with a clear view of the sky. There is only a panel, of about one foot, between the front and rear panels that is not transparent. Front-seat occupants find a generous amount of room, largely due to the vehicle's generous width. There is a large center console with a storage box big enough for a laptop computer. Two decent cupholders reside alongside the substantial shifter. The center stack is angled outward to make it easy to reach the large knobs for the climate and entertainment controls. The rear seats offer a decent amount of leg room; in fact, there's two inches more here than you'll find in the larger Explorer. Headroom is also reasonable in the rear, even with the optional Vista Roof. The rear-center passenger even gets more room than normal in a vehicle of this size, thanks to the wide track. Getting in and out is easier thanks to rear wheels that are placed well back and thus cause less intrusion from the wheel wells. Cargo carrying is an area where the Edge excels. The tailgate lifts to reveal a wide opening. With the rear seats in place there's a reasonable amount of cargo room, but pressing a button automatically reclines the rear seats to open up 69.0 cubic feet of storage space on a nearly flat floor. Furthermore, the front passenger seatback can be folded forward to provide a mostly level floor space for long objects all the way to the dashboard. The rear seatback splits 60/40 for increased versatility and the back reclines several degrees on all models for improved rear-seat comfort. Underway, the Ford Edge handles reasonably well, given its considerable size and weight. Having its wheels out near the corners aids stability and handling. Naturally, the higher center of gravity prevents the Edge from being as nimble as a sports sedan, but unless you need to drive fast through the corners, you'll find it is perfectly adequate with less body roll than a regular SUV. Ford's 3.5-liter V6 engine has variable valve timing and is much smoother and more refined than its previous V6s. This engine is mated to a six-speed automatic transmission. We found the engine produced a good range of power at all speeds and the transmission shifted smoothly. We would rate the performance as middle of the pack: It's neither a barnburner nor a slug. But it does deliver notably good fuel economy. We found the rack-and-pinion steering provided good feedback with precise control. We tested Edge models with both the 18-inch wheels and the 20-inch wheels and found the latter did not produce a harsh ride, despite the larger wheels and shorter tire sidewall. So, buyers can opt for the flashy looks without worrying about paying a hefty price in ride quality. We drove the Edge with all-wheel drive, which helped make the car more sure-footed. The all-wheel-drive system is simple, with a viscous coupling that constantly alters the power to the front or rear depending on the need at any given time. The Edge is not designed for off-road use yet it has a decent ground clearance of eight inches. Ford even lists its approach angle (16.5 degrees), departure angle (26.6 degrees), and ramp break-over angle (17.2 degrees), specifications usually reserved for off-road vehicles. We think the Edge will be fine on unpaved roads. We drove the Edge through snow and ice in Chicago and found it handled quite well thanks to the independent suspension and all-wheel drive. The four-wheel disc brakes worked well, although we haven't tested them with a fully loaded vehicle hurtling down a mountain road. Ford's AdvanceTrac electronic stability control is standard on all models; AdvanceTrac includes the functions of ABS and traction control to help the driver maintain control in slippery conditions or in emergency avoidance situations. The Ford Edge offers striking styling. The Edge is a far more efficient vehicle than a traditional SUV. Opt for all-wheel drive and you've got a great all-year-round car as well. This is a roomy five-seat vehicle with two rows of seats. We find the Ford Edge a smarter choice than a traditional, truck-based SUV, unless you are towing heavy trailers or frequently driving over rugged terrain. NewCarTestDrive.com correspondent Kirk Bell took a test drive in the Edge in Chicago. John Rettie drove the Edge in and around San Francisco. Head/hip/leg room, f: 40.0/54.8/40.7 in. Head/hip/leg room, r: 39.3/56.3/39.6 in. Cargo volume: 69.0 cu. ft.